As a custom home builder, Drees Custom Homes make families dreams come true. After all, they know a lot about family and putting down roots. Since 1928 the company has been owned and operated by the Drees family. This year marks the company’s 90th anniversary. And, to celebrate they have built a new anniversary model home in each of their 12 markets. As a four-generation family business, Drees’ success continues because of their strong tradition, commitment to excellence, and their unique ability to build homes around the future—all of which is currently being showcased in their anniversary model homes. But, it’s Drees new construction technology that they incorporate into all of their homes that has won over homebuyers. Their homes are built around efficiency and use the latest in energy-saving technology. You’ll love all of the advantages of building with Drees Custom Homes. But, there’s no doubt that the best advantage is being able to build your dream home where you want to live. Whether it’s on your own lot or one of Drees custom lots their team of highly-trained professionals are there to guide you every step of the way. You also have the option of bringing your own design to the table or choosing one of their many floor plans. After all, when you buy a Drees home it’s your home your way. As a prospective homebuyer you can expect nothing less than 100% quality. You’ll also get legendary craftsmanship, the flexibility to modify your floor plan, countless options, and award-winning home designs. And, you’ll also get the best of everything. From quality building materials, to extraordinary floor plans to chic, comfortable designs—you’ll find it in a Drees home. And, to make your life just a little sweeter they’ll provide distinct architectural choices. They also offer cabinetry, flooring, and fixtures in traditional, trendy, and even a little quirky styles to help you personalize your home and lifestyle. However, in addition to a quality product, you’ll also receive top-notch customer service from a family-oriented company that understands the importance of personal attention. Their customer service and work ethic is everything you would expect from a family business. However, Drees resources and ranking as the 10th largest privately owned company in the U.S. allows them to offer the flexibility and customer care of a small business and the muscle of a large one. In Travisso, Drees Custom Homes offers nine floor plans ranging in price from $585,000 to $800,000. 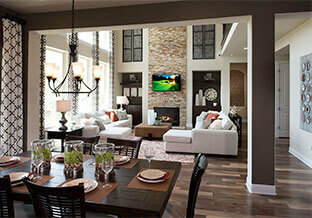 Or, if you can’t find the right floor plan to fit your personal style, you can custom build your home from scratch. Located in Leander, the master-planned community of Travisso offers unsurpassed beauty in a top-rated school district and a convenient 30-minute drive to downtown Austin. And, there’s so much more such as resort style amenities, 2017s Best Clubhouse in the state, and an outdoor landscape perfect for hiking and biking. What’s not to love? Visit us today. For information call 512-243-8583.